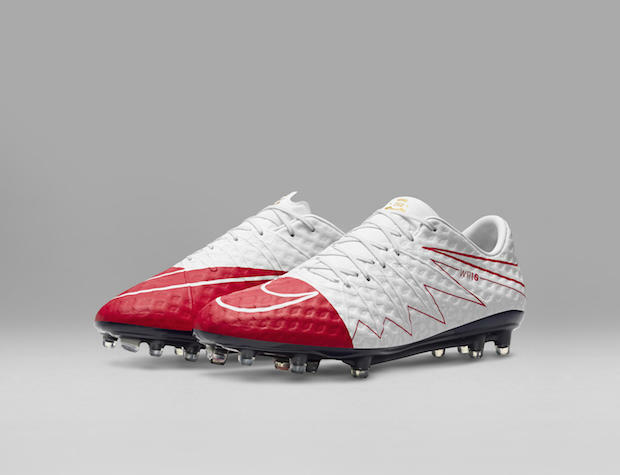 When Nike released photos of the Hypervenom Phantom II, I was excited. I was a huge fan of the first generation phantom and was eager to check out the next-gen boots in person. After the package arrived, the photos online do not do it justice. Although the upper is a bit stiffer than the first generation, the upper is still a very nice Nikeskin material that feels great. This generation is extremely comfortable and offered zero discomfort out of the box. The collar does not cause any discomfort and the seam that caused so many problems on the Obra and Superfly has been moved to a slanted version and does not rub me at all. 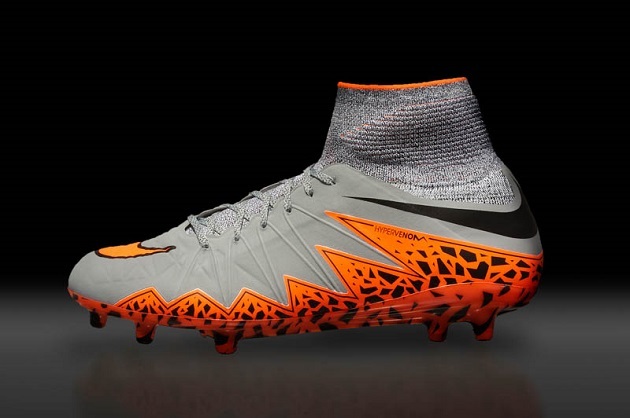 These boots look absolutely stunning, with the grey upper combining with the orange and black cracked look found in a zig-zag pattern near the soleplate. The outsole continues the orange color with the same black cracked pattern that looks something like an animal skin print of sorts, like a cheetah or snake. The Dynamic Fit Collar looks great with the Phantom and is a welcome feature for the boots in my mind. When slipping these on, an under lay of orange Flyknit is exposed where the tongue should be. The design of the grooves on the Nikeskin upper show that the boot is made to help striking as well as help the player with agility. 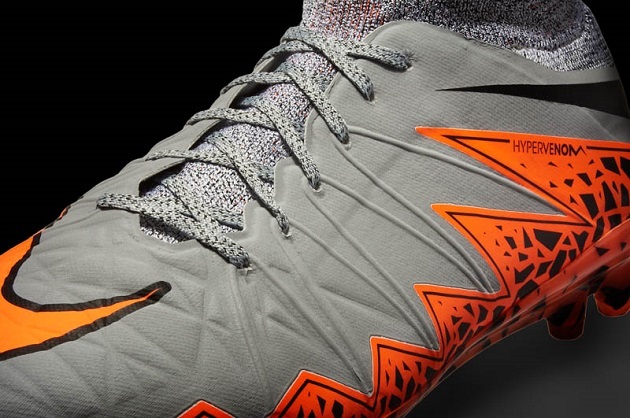 The Phantom is obviously the highest end boot in the new Hypervenom silo. 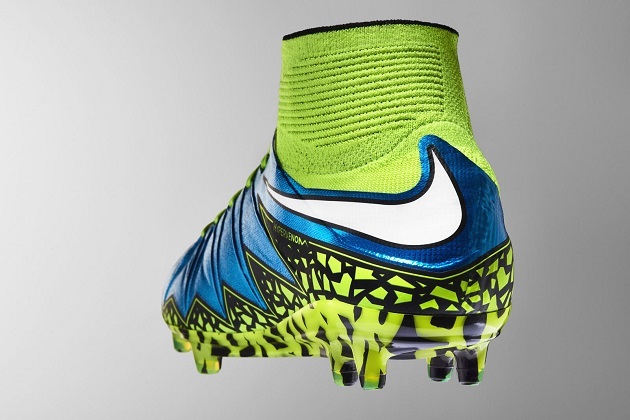 The boot has the Nikeskin upper that is a little bit thicker. I actually like the thickness of the upper as it is now. It adds a bit of extra protection while still allowing a nice feel on the ball. The outsole is the exact same concept as the first-generation Hypervenom with the conical studs found in both the forefoot and heel area with the only difference being it is a tad bit softer. 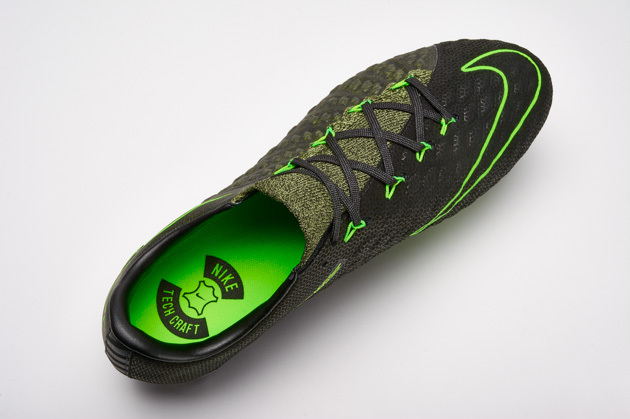 The Hypervenom stud pattern is one of my personal favorites right now and has served me well once again. This one features a design that I touched on earlier that looks like an animal skin or cracked pattern. This pattern will fade away after some time but after two weeks of testing; the pattern still looks great and has not faded at all. The Dynamic Fit Collar is a bit thicker than the Obra and Superfly but it still offers the same type of performance. I truly felt that I was locked in to the boot with the help of both of the collar and the Flywire cables. The tongue is non-existent on the boot as the Flyknit found on the collar reaches down to make a tongue. The Flyknit is only found on the tongue and collar and that is it, the rest is Nikeskin. The 3D texturing or creases, take the places of the Nikeskin pattern found on the first-generation to add a nice striking area. The laces are pushed to the lateral side of the boot to help with that larger striking area. A layer of ACC is applied over the top of the upper to help aid with the feel for the ball and performance in all playing conditions. I played in these about two hours a day for training and in some matches and these gave me a perfect performance every time. I have enjoyed my time in the Phantoms and will be wearing these until I just cant wear them anymore. 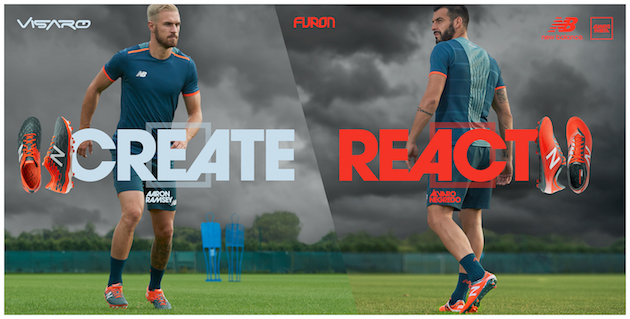 The boots fit like a glove and has all of the cushion you need to feel comfortable to play without any worry. These are currently one of my favorites that I own at the moment, if not my favorite. After hours of playtime in the Phantom II, the comfort that I experienced out of the box never faded. I never felt like my foot was being rubbed or felt too tight within the shoe. The Flywire cables helped keep my foot locked down onto the soleplate and allowed me to play without worry of heel slippage or the boot feeling loose at all. Overall, the fit is perfect to me. With a $275 dollar price tag on these boots, the price will always be an issue for people but with all of the latest Nike tech that comes with these boots, if you can catch these below retail price, I would encourage you to pick them up. 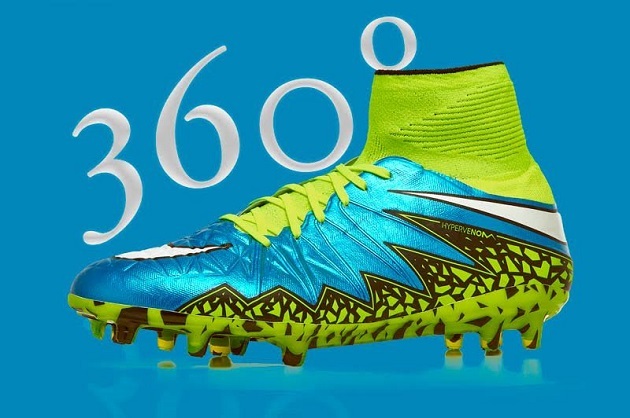 Lucky for you, SoccerPro has them below retail price, head over and check them out! The likes of Robert Lewandowski, Edinson Cavani, Alex Morgan, and headlining athlete, Neymar. These talented strikers have all been spotted in the Phantoms and have all been able to score in them already. If the players love them and are able to do their job, then that shows that Nike have made a quality boot. Overall, I have nothing but great things to say about the new Phantoms. Every time I have had a chance to go to the field I bring these along with me now. A lot of people will not like the collar on these but I really like it and I think it helps add a more seamless feel from leg to boot like Nike says the collar does. A lovely pair of boots from Nike. 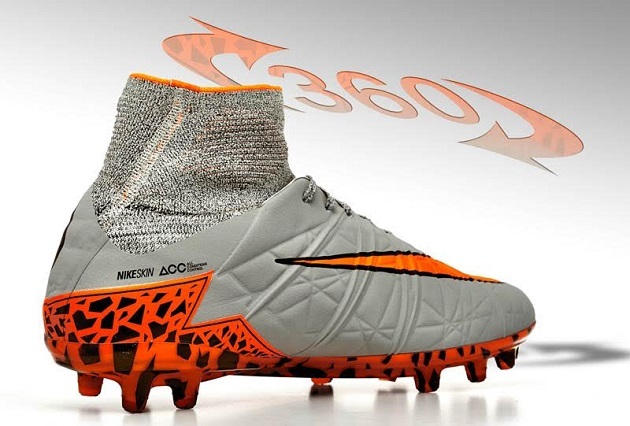 Do the new hypervenoms hold up better than the old hypervenoms? Within a few weeks of wear. Yes. I loved the first Hypervenom as well but durability always seemed to be the issue. Nike made this one much more durable with a slightly thicker upper and it should hold up a lot longer than the first. Jose, I have a little bit wider than normal feet and I had no problems with these. If your feet are very wide then I would suggest heading to a local store and trying them on or ordering a pair then trying them on inside and see how they feel. As long as you don’t pull the flywire cables too tight I think these are the best option for wide feet that features the collar. Can’t decide between the normal or leather versions of Phantom 2’s, any recommendation? I have not been able to test out the leather version but I would imagine if you enjoy leather cleats then possibly the leather but since I have only tried out the synthetic, I can say I really enjoy it. Both are great options no doubt. We have a play test of the Leather version on YouTube actually so you can check that out. I heard they come 1/2 size smaller? Is this true? About how long do the hypervenom phantoms last? I would like to purchase a pair of high end nike boots but if durability is going to be an issue i might not. I train about once/ twice a week and also have a match every week. Do Not buy these shoes or u will be sorry. A bunch of kids on my sons U-16 Premier team purchased these garbage shoes last year. Not one of them made it though the season. Not one single pair. They sock part of them tore on every single pair. The strikers were the worst. At first Nike replaced them and then after a Nike rep told one of the players to have everyone send them in for replacement, then we got “notified this was now ordinary wear and tear” and they destroyed the shoes and would not send them back today, Some warranty right. I ask why they told us to return them, and how the same defect can be under warranty for some shoes and not for others when they were all purchased in same month and I might as well have been speaking to a robot. Apparently, some one just looks at them and guesses.